B'resheet/Genesis 25:21 And Yitz'chak entreated Adonai on behalf of his wife, for she was barren. And he prevailed upon Adonai and his wife, Rivkah, conceived. Hirsch provides a link to the root , "to bore into", and a noun from that root , "a breaking in". He points out that the verb is used in "the men rowed hard to get back to dry land" (Jonah 1:13, ESV), "the forcible pushing forward of a ship against wind and sea". Hence is a penetrating prayer and request. Targum Onkelos, on the other hand, translates both occurrences of as if they were 'pray', thus rendering the verse "And Yitz'khak prayed before Adonai on behalf of his wife because she was barren; and Adonai accepted his prayer and his wife Rivka conceived". This and the choice of the word 'before' is partly to soften the idea of a close physical proximity between Yitzkhak and HaShem. The second of the two occurrences, however, is more striking: Onkelos is uncomfortable about the possibility of Yitzkhak 'prevailing', which might suggest that Yitzkhak had some level of control over HaShem, so the phrase is turned completely around. Instead of Yitzkhak prevailing, now HaShem accepts Yitzkhak's prayer. An altogether safer translation, but one that has taken the bite and the urgency out of the text, reducing both G-d and man in the process. The Sages of the Talmud were less squeamish: "Rabbi Isaac stated: Why were our ancestors barren? Because the Holy One, blessed be He, longs to hear the prayer of the righteous. He further stated: Why is the prayer of the righteous compared to a pitchfork? As a pitchfork turns the sheaves of grain from one position to another, so does the prayer of the righteous turn the dispensations of the Holy One, blessed be He, from the attribute of anger to the attribute of mercy" (b Yevamot 64a). Sforno mildly comments, "Even though he had been assured children, he prayed to G-d that it be from this worthy woman"; since Yitzkhak had heard the angel telling his father Avraham, "I will greatly multiply your seed as the stars of the heavens, and as the sand which is on the seashore; and your seed shall possess the gate of their enemies" (B'resheet 22:17, NASB), and he was that seed, there was no question whether he would have children or not; the only question was with whom and when! Hundreds of years later, the L-rd spoke through the prophet Isaiah to encourage the people of Israel. He told them, "On your walls, O Jerusalem, I have set watchmen; all the day and all the night they shall never be silent. You who put the L-RD in remembrance, take no rest, and give Him no rest until He establishes Jerusalem and makes it a praise in the earth" (Isaiah 62:6-7, ESV). The L-rd Himself has set the watchmen on the city wall in order to cry out 24 hours in every day, 7 days in every week, and never be silent. He had promised the restoration of Jerusalem and He had called people to keep on reminding Him about His promise until it was carried out. Not only are the prayers to take no rest for themselves, but they are not to give the L-rd any rest either until He has done what He said He would do. Clearly, although Jerusalem was restored in the days of the Persian empire and reached its peak of glory - the Temple was one of the seven ancient wonders of the world - in Yeshua's time, it has since been destroyed by the Romans and never rebuilt; Israel remain scattered and the prophecy that "in the cities of Judah and the streets of Jerusalem ... there shall be heard again the voice of mirth and the voice of gladness, the voice of the bridegroom and the voice of the bride, the voices of those who sing, as they bring thank offerings to the house of the L-RD" (Jeremiah 33:10-11, ESV) still awaits its final fulfillment. Those with a burden on their hearts to see this come about must follow the L-rd's instructions: take no rest and give Him no rest until He fulfills His word. Yeshua told His disciples a story to illustrate the importance of persisting in prayer to remind G-d of His promises. "There was once a judge in some city who never gave G-d a thought and cared nothing for people. A widow in that city kept after him: 'My rights are being violated. Protect me!'" (Luke 18:2-3, The Message). Notice that the widow didn't abuse the judge, she didn't go around spreading lashon hara about him; she just kept coming to him and reminding him that it was his job to carry out justice and that he needed to do something about it. "He never gave her the time of day. But after this went on and on, he said to himself, 'I care nothing what G-d thinks, even less what people think. But because this widow won't quit badgering me, I'd better do something and see that she gets justice - otherwise I'm going to end up beaten black and blue by her pounding'" (vv. 4-5, The Message). The judge tries to ignore the widow but finds that the constant repetition of her demands for justice is wearing him down; he can't even take a day off without the widow turning up and reminding him of his duty! Does the judge finally respond with good grace, because he finally recognises that it is the right thing to do? No, on the contrary, his motives are entirely selfish: he is out to protect his own hide and get some peace and quiet. Yeshua then goes on to say that since G-d is not like the corrupt judge, He's not going to make people wait any longer than they have to for an answer or an action; the instant the right time comes, G-d will act, He will act fairly, He will act with justice and He won't drag His feet. He will respond to all those who continue to cry out to Him for help. 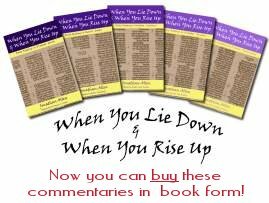 Yitz'khak had persistent faith; enough, the text tells us to 'prevail' against G-d. G-d Himself set up watchmen who would neither rest themselves or give Him any rest until He did what He said He would do. Yeshua's story plainly shows that His disciples are expected to exercise that dogged persistence. Yeshua's final question is still relevant today: "How much of that kind of persistent faith will the Son of Man find on earth when He returns?" (v. 8, The Message). Application: And you? Has G-d given you a vision or a burden on your heart? Do you seek Him, "night and day, fasting and praying" (Luke 2:37, ESV) until it is fulfilled?